Sands Beach Club befindet sich am südlichen Ende von Shore Drive und ist eine familienorientierte Resort. Shore Drive ist direkt in der Mitte von Myrtle Beach in der Nähe der berühmten Restaurant Row. Broadway at the Beach ist nur zehn Minuten südlich und Barefoot Landing 10 Minuten nördlich. Die zusätzlichen Fenster und Aussicht von diesem OCEANFRONT CORNER UNIT Wohnanlage schafft eine helle und offene Gefühl, mit einem spektakulären Blick auf South Beach. Sands Beach Club ist das letzte Eigentum auf Shore Drive und schließt sich dem Dunes Club, ein eigenes ganzjährig Gemeinde, dies schafft eine geräumige Ozean Erfahrung mit viel Platz für alle. Diese Eigentumswohnung befindet sich im ersten Stock mit Parkplatz unterhalb befindet. Queen-Size-Master, 2 Einzelbetten im zweiten Schlafzimmer. 2 Pools und große Sonnenterrasse. Vor-Ort-Restaurant und Lounge. Beleuchtete Basketball- und Tennisplätze (zwei). Einfacher Zugang mit Aufzügen (vier). * Sorry, keine Haustiere und Rauchen in Einheit. * Samstag bis Samstag mieten. * SNOWBIRDS WELCOME - November bis März mit Spezial-Angeboten! The views were the best I have ever had!!! Stunning! MH, thanks for the review. It always makes me happy when a family has a great vacation. Happy to share the condo with your family. Excellent room, great view, convenient parking, easy beach access! Not as crowded as some resorts, and definitely family friendly. It was a little out of the way, which made it more family friendly than others closer to the boardwalk. Great value for a great price! We loved our stay in this condo. The view was perfect. The condo was clean and had everything we needed. Easy access in and out. Elevator was fast. Perfect for a family vacation! Great experience! Took my daughter and two friends for Spring Break. Chose this unit for the oceanfront view, quiet location so I could enjoy the morning sunrise. It did not disappoint. 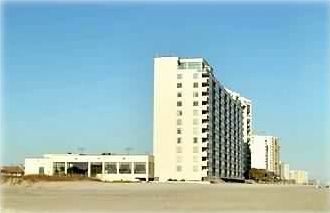 This unit has a unique setting with the waterway feeding in to the ocean creating a sand peninsula for added beach and no close neighbors to block your views. This unit is right across from the restaurant on site. Food was ok - beers was ice cold! The unit was a good size for 4 people! We have stayed in several units at Sands Beach Club and this in one of the nicest units. It is well maintained and nicely decorated with a few personalized items. There are a couple other things about this condo that set it apart from the rest, both relate to being a southern corner unit. First the corner units are slightly larger. This translates to a bit more room in the dining area which makes getting around the table much easier. Additionally, as a southern corner unit there are additional windows that overlook the marsh area besides the normal windows and sliding glass door that overlook the ocean. This also means that the balcony has open sides facing the ocean AND the marsh. With the additional features of this condo and the same or better rental prices, this condo is an excellent value. As for the area in general, it couldn't be more convenient. Kroger is right up the street as are plenty of restaurant choices ranging from seafood buffets, fine dining and quick meals. Walmart is also located close by for anything that you forgot to bring. Since Sands Beach Club is next to the marsh there is not another building on the south side of the resort. This means extra beach! We have been several times in the peak of the summer (July 4th week) and there is still plenty of room on the beach. In addition the the extra length of the beach it is also a very wide section of the beach. The marsh is an excellent place to play for those that are intimidated by waves or just want to search for shells. You will see people of all ages enjoying the marsh, plus people crabbing in the deeper areas a little further inland. The pictures display exactly what you will get with this condo. What they don't show is that the beach is a stone's throw away, the furniture is very comfortable, the condo is extremely well kept and it only takes a couple minutes to walk from the inside of the condo to the ocean - this is probably most important for people with kids. You have a beautiful view of the ocean from a huge window in the master bedroom, living room and several side windows in the living room and dining area. The balcony is perfect for waiting out a storm if you have to. The second bedroom is a great spot for kids as it's far enough away from the living room and balcony for them to get a great night's undisturbed sleep. The kitchen is stocked with all of the basic needs. Last, the owner is as easy to deal with as I've found. We will definitely be back! Linens and Departure Cleaning are all included in the weekly rental rate. Please call or e-mail with any questions or concerns.